A key meeting between US President George W Bush and Iraqi Prime Minister Nouri Maliki aimed at tackling Iraq's growing violence has been delayed. The two men are in Jordan and were to have evening talks with King Abdullah, but Mr Bush and Mr Maliki will now meet on Thursday, officials said. The move came after an Iraqi political grouping suspended its participation in government in protest at the meeting. It also follows the leak of a US memo raising doubts over Mr Maliki. US officials said the change to the schedule was because Mr Maliki had met King Abdullah earlier in the day, denying the move was a snub by Mr Maliki or related to the leaked memo. A breakfast meeting between the two is still due to take place. President Bush is expected to give public support to Mr Maliki, but privately will be renewing pressure on him to take action against Shia militias, analysts say. The two are also expected to discuss moves to transfer more responsibility to Iraq's security forces. The Iraqi prime minister has been under enormous pressure at home not to meet President Bush, says the BBC's Jon Leyne in Amman. In protest against the planned meeting, the Iraqi political group loyal to Shia cleric Moqtada Sadr suspended its participation in the government. The group, which has 30 MPs and a handful of ministers, said the meeting was a provocation to the Iraqi people. 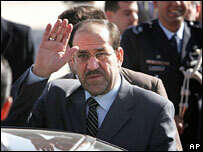 The group had been making the threat for some days and had called for Mr Maliki to call off the Jordan meeting. Mr Maliki has also been the subject of a leaked US memo, published in the New York Times, in which Mr Bush's national security adviser, Stephen Hadley, raised doubts about Mr Maliki's ability to control sectarian violence. According to the Times, the 8 November memo said that while Mr Maliki's intentions seemed good, his capabilities were "not yet sufficient to turn his good intentions into actions". Earlier, White House spokesman Tony Snow, travelling with Mr Bush, said the chief aim of the memo was "to support Maliki and enhance his capabilities". 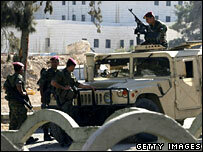 The Amman summit follows one of the bloodiest weeks in Iraq since the American-led invasion in 2003. Mr Bush is facing growing political pressure over the lack of progress in Iraq and the rising tide of violence, says the BBC's Jonathan Beale in Washington. Even the White House acknowledges the violence has reached a new phase, though it still dismisses talk of a civil war, he says. Mr Bush is also under pressure to redouble US efforts to resolve the Israeli-Palestinian conflict, our correspondent says, and will be told by King Abdullah that it is the most pressing crisis in the region. Even Washington's strongest Arab allies are showing signs of frustration at US policies in the Middle East, he adds. Iraqi President Jalal Talabani has been holding talks with Iranian leaders in Tehran in an attempt to contain the sectarian violence, urging Iran to back the elected Iraqi government, not Shia militia groups. On Tuesday, King Abdullah told the BBC Arabic Service he was very concerned about the situation in Iraq. "We [urge] our brothers in Iraq, the Iraqi political and religious leadership - be they Shia or Sunni - to realise the seriousness of the situation and not to allow any conspiracy to pass aimed at dividing or destroying Iraq in a whirlpool of violence and chaos," he said.